We've been watching the setup develop for months of what has turned out to be a long and painful process, as the world fights to hold on to a sense of growth, expansion, and/or aggression (the alternatives being contraction, depression, and/or despair). We called the first chapter of "World in Crisis" which we then discovered included the beginnings of the Ukraine crisis, a missing Malaysian airliner, and a Korean ferry disaster. Part II of this "World in Crisis" phenomenon saw ISIS take parts of Iraq and Syria, eruption of conflict with Israel/Gaza, further escalation in Ukraine, and another downed Malaysian aircraft with all aboard lost. Part III is nearing. In the previous post, we summed up the latest on this complex global crisis pattern that began in late February. The Ukraine crisis kicked it off, then the Malaysian jet disappearance made headlines for weeks. The Korean ferry sunk, killing hundreds. In the U.S. there were late winter storms, killer tornadoes, and a barrage of news stories of people "losing it" and shooting people. It was discussed that with all of the angst and distress, globally, and within the U.S. that these events appeared to be of the type that signal the main event yet to come-- precursor events. We expected the "disaster signal" (see 1st chart below) to stay above the line drawn near the bottom right of the chart and to at some point turn up. Through all these weeks, this signal line has been churning away near the baseline, neither clearly going up toward a new set up, or falling down in release. It has been a difficult time of transition for many, yet the big impact for the U.S. has not yet appeared. While there is not yet a clear indication that the "grand finale" is imminent, there is a clue from social mood and the stock market that it is becoming quite close, likely within a few weeks away. The chart below shows expected stock market movement derived from social mood (Google Hot Trends) versus actual stock market movement. The two lines on this chart are usually pretty much in sink. What this is telling us is two things: 1) The market trend is up, and in line to continue to new highs; and 2) The market is not able to go much higher than it currently is without first making a sharp drop down to at least the 1700-1750 area (the social mood signal dropped there in March, but the market didn't follow along-- it can't get away with that indefinitely). In other words, an 8 to 10 percent correction is required for the market to continue much higher than where it is right now (S&P 1884). If by chance, markets continue to eek out another 2 percent (1922-ish), the drop will need to be that much greater (10 to 12 percent). According to Robert Prechter's research in Socionomics, the big events tend to come near market bottoms. Tomorrow's daily mood signal is showing a dip. Is this the beginning of the drop toward the 1700s? Will tomorrow be the next step closer to this grand finale still a few weeks away (before the market returns to an uptrend)? If not, we will keep watching for the next indicator. The Next Crisis Wave Approaching? Back on 24 February, we posted our observation that globally, the risk for violence and war was on the rise. It seemed somewhat preposterous, as the news was all about diplomacy and cooperation (Iran negotiations, Syria destroying weapons, etc.). Yet, that is what the patterns in social mood were displaying. On 28 February, we posted World in Crisis, U.S. government and people not immune. Hours later, the Ukraine crisis was in the news. There were indications in our data of an approaching major disaster in scale, but little to no U.S. casualties were projected as likely accompanying this. For that reason, we called it a crisis, not a disaster. Also, from the social mood pattern, we determined the type of crisis projected is type NE. From the post: "The most likely types of events that show up with type NE are an economic disaster, an attack from another geopolitical entity, or if a natural disaster, a winter storm. It’s also associated with anxiety and risk aversion." By 5 March, we noticed that the charts were showing that this crisis had still not had a substantial U.S. impact, and did not get the telltale "disaster pressure" relief indicated by orange lines on the chart above. We posted the date information of 6-13 March as the likely timeframe for this. During the period of 7-14 March, markets were down in what may be the initial warnings of a much larger decline. The relief of "disaster pressure" has shown up in the charts, yet the crisis is not over, nor has it yet had a substantial U.S. impact. During the time period under watch, background disaster-type events were showing up, yet they were not of major U.S. impact: a Malaysian airliner disappeared over the ocean, a U.S. building exploded from a gas leak, several people were killed when someone crashed their car into a stage, and earthquakes in Northern and Southern California not causing much damage, but causing concern and making headlines nevertheless. The scale of all of these events appear to be "disaster precursors." They show up near major disasters or crises, but aren't the main event. For this reason, we have colored the area of 7-14 March yellow on the chart. If there is something much larger still developing in this very complex pattern, we would expect the line on the chart to turn up over the next few days, and to remain above the horizontal black line at the right side of the chart. Things would tend to get really bad as the curve reached its top again, likely in another week or two. Stay tuned. The above is an excerpt from the daily blog: Collective Mood, Global Events, and the Markets. Early on 28 February, we posted about an imminent Global crisis that would strongly impact the U.S. and its people. Hours later, the Ukraine crisis began. The latest info shows that the U.S. impact from this or additional events will show up as soon as tomorrow. This could be the beginnings of the greatest crisis the U.S. has faced in years. 1) The likely timeframe is March 6-13. 2) Although dramatic in effect on the U.S. it does not likely involve large U.S. casualties like most "disasters." 3) The social mood configuration shows a rising risk of panic. 4) The category of event is MoodCompass type NE which would usually show up as a) an economic disaster, b) an "attack" (i.e. a perceived "victimization") from a geopolitical entity, or c) if a natural disaster, a winter storm. 5) There is little chance of it being a natural disaster. 6) The precipitating cause is most likely an international disaster or crisis, meaning it could involve further fallout from the Ukraine crisis. The top chart below shows the relatively low estimated U.S. fatalities of this "disaster." For this reason, as well as the indication of it originating outside of the U.S., we are referring to it as a "crisis." 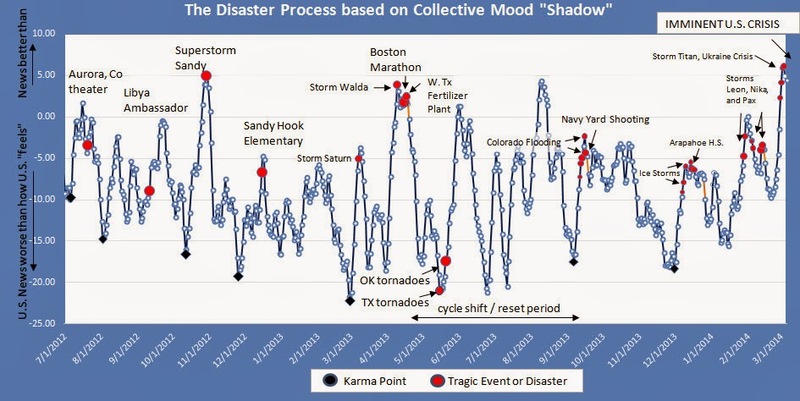 If the second chart is looked at carefully, especially beginning with the Boston Marathon event, the pattern can be observed which makes this crisis appear especially serious. Is Pax the Big U.S. Disaster? The graph below shows the scale of disaster that is likely to occur if the anticipated disaster or tragedy occurs on 14 February or later. Will storm Pax claim another 10 or even more lives in the next day or two, or will pressure continue to build, creating an even larger disaster in another few weeks? That is the current question being asked as the current social mood data is compared with previous disasters. Since late January, after Storm Leon, a United States disaster has been "waiting" to happen. 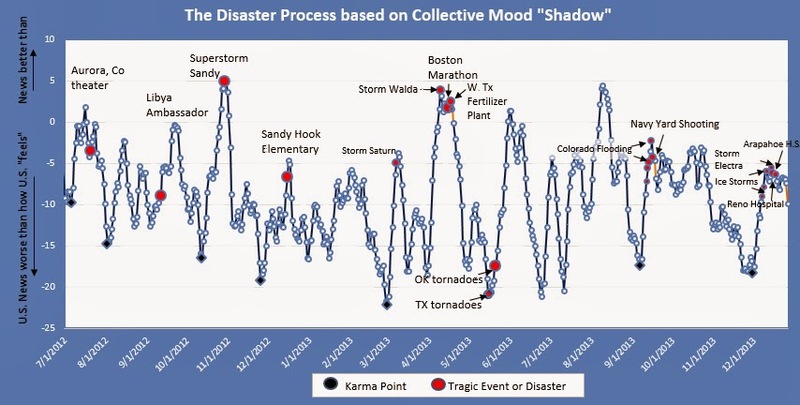 The chart below shows the divergence between U.S. collective mood and mood themes in top U.S. news stories since July 2012. Recently, there has been an amazing repeating occurrence of severe ice storms the next two times the line in this chart got into the same area as Leon. Nika was bad, but Pax looks like it could be worst of all. Storm Nika did not relieve the "pressure" that would have been released if that was the disaster. After the Boston Marathon bombing, the Navy Yard shooting of a few months ago, and even the Arapahoe High School shooting, there is a noticeable drop in the chart marked by an orange line. This has not yet occurred in this cluster. The most likely type of event expected, as indicated by current collective mood patterns is type NE. This would probably be an economic event, or a Winter Storm if a natural event is the disaster. Looking at the pattern occurring for this entire cluster, the most likely event would be type NE and SW. This would likely be an international economic event that impacts the United States, a geopolitical escalation that the U.S. feels victimized by (e.g. act of war or internationally sponsored terrorist attack), or, if a natural event, a Winter Storm with heavy precipitation and winds. Is Pax finally going to be the event that relieves this building pressure? It certainly fits the type, and some are saying that Pax may be one for the history books, but our suspicions are that something else is still to come. Yet, Pax could be the big disaster that will get rid of this growing monster of potential. The only way to know for sure will be after the fact. If a sharp drop shows up in the chart (i.e. the orange "release" lines) then we will know it was the big one. Whatever shows up as the disaster or tragic event when it does appear, will impact us all on some level. It will be something everyone talks about for days. Imminent U.S. Tragedy - Does it lead to War? The Disaster Curve (see above) peaked on 31 January 2014. This means that if the pattern continues as it has over the past couple of years, the next major U.S. tragic event is imminent. The Boston Marathon bombing occurred 6 days after the peak immediately before it. The Navy Yard shooting several months ago occurred only 1 day after the peak preceding it. 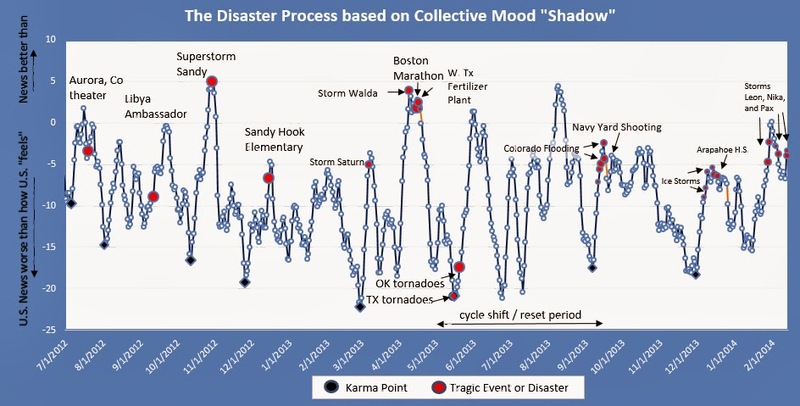 The type of disaster or tragic event can take many forms, but the current social mood pattern can often give us clues. The current pattern indicates that it will likely be type SW. This is associated with international events, the military, acts of war, sports, and leadership (e.g. the President or high ranking U.S. leader). Should there be a natural U.S. event on the horizon, type SW is most often associated with a volcano or flood. Globally, there may be disasters or tragic events during this period that are also of this same type. While sports is one of the listed probable types of events, and Superbowl Sunday is only two days away, that does not necessarily mean that the Superbowl will be subject to attack, yet it does merit a close watch. It is likely that whatever occurs has an international component or leads to war or the brink of war. We will have to see how this shapes up over the next few days. The United States is about to experience another major tragedy. This one should be more impactful to the average American than the Arapahoe High School shooting was. Depending on where the current upswing in the above chart peaks, this next event should be more impactful than the Navy Yard shooting of a few months ago, and possibly near the subjective impact of the Boston Marathon event of last year. Without getting into the details of the chart this time around, the event should occur within a day or two of the next peak in the above chart. It may be a mass violence event, but could be some other type of tragedy that allows people to emotionally connect with what is happening in the news. 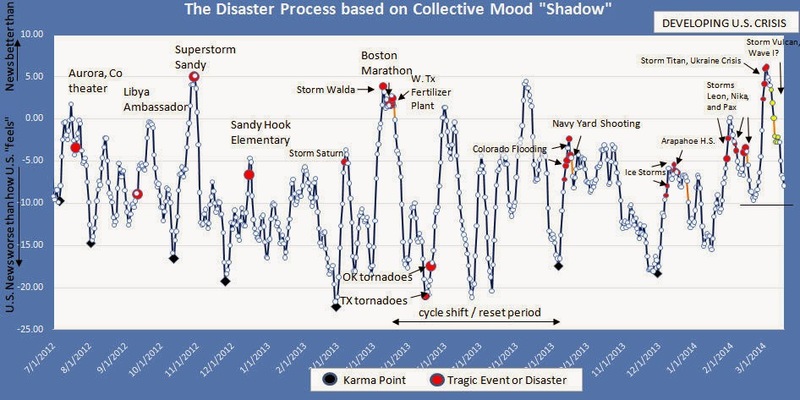 Mass Violence Threat: Since December 8, 2013 a collective mood pattern coinciding with U.S. disasters and mass violent incidents has been observed and discussed here. Of particular interest is the pattern observed with the Boston Marathon event, the Navy Yard Shooting, and the recent Arapahoe High School shooting (see chart below). 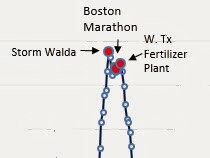 The Boston Marathon was followed by the W. Texas fertilizer plant explosion, and then was resolved (shown by the orange line). The resolution in the pattern after the Navy Yard shooting is shown by an orange line. The Arapahoe High School shooting was followed by the Reno Hospital shooting. Until the orange line shown for the 26th, there has been no resolution and another event has been anticipated. As of the 26th, this pattern can be considered resolved whether another event occurs or not. The latest information suggests the next big U.S. tragedy will be early this week. One week ago, the latest information showed the next big U.S. tragedy was days away. On the 10th, it appeared imminent. Friday's shooting at Arapahoe High School could have been the next disaster, but it wasn't. It was a tragedy, but did not resolve the pattern that has been developing in collective mood. There is something else still likely to show up. Below is the latest graph of social mood relative to U.S. news (an update to what was presented last week). Storm Electra has been added to the chart. Notice what has happened to the pattern. This line had appeared to be peaking near December 10th as the ice storms were completing. This would mean that a major U.S. tragic event was right around the corner. The Arapahoe shooting happened immediately after this apparent peak, but this line then started to climb again. The added segment over this past week, with Storm Electra added, shows a peaking had not yet occurred... until now. 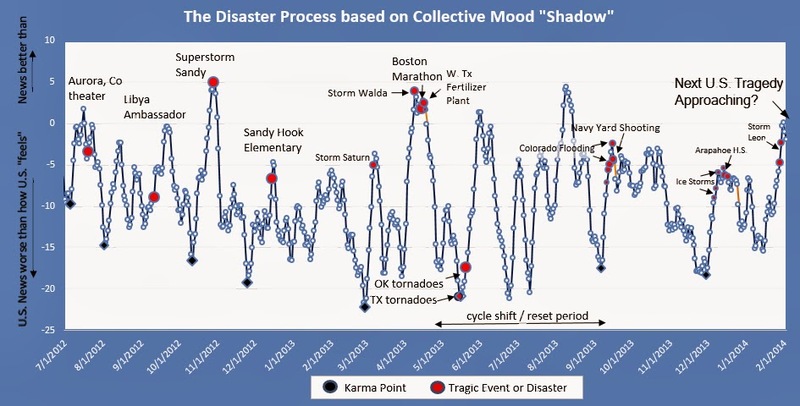 So, again, as was said in the original post on this event, if the pre-disaster pattern that can be clearly seen with the Boston Marathon event, and the recent Navy Yard shooting, continues to hold true, then America is only days away from its next big tragedy. The Next American Tragedy... A Few Days Away? America's next big tragedy may be only a few days away. This has been detected by observing changes in social mood, and in the divergence between themes in the news and how people collectively are feeling. For more details on how this is detected, see Disasters: Society's Shadow. For more details on where America is now, and this particular alert, keep reading. The chart below is one of the ways we watch the changes in social mood relative to the news. A pattern emerged prior to every major tragic U.S. event since July 2012. You will see one of the black dots, labeled Karma Point, followed by a red dot, labeled Tragic Event or Disaster. The exception to this is that immediately following the very impactful Boston Marathon event and out through September of this year, there was a disruption in the pattern. If the previous pattern has returned, as appears from the Navy Yard shooting in September, then America is days away from its next big tragedy. We will be able to discover within a few days, if this is true, or if there is some unidentified new pattern (or no pattern) in play. 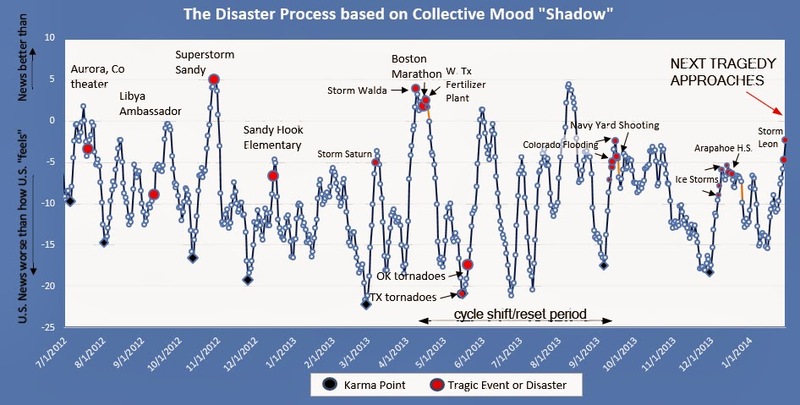 Another interesting feature that has been noticed in the last few disaster clusters is a possible relationship between stormy weather and the immediately following tragic events. In April 2013, immediately preceding the Boston Marathon event, was a disruptive and damaging storm, and this line on the graph peaked. In September 2013, immediately preceding the Navy Yard Shooting, there was a major flooding event in Western Colorado. Now, in December 2013, after the prerequisite black dot on the graph (Karma Point), there are disruptive and damaging ice storms. The big question is, does this line now peak, with a major U.S. tragedy immediately afterwards? We will know in a few days.